Soap Making Resource's exclusive no-line acrylic cylinder soap mold is the perfect tool for easily making circular soaps. No lining, no coating with petroleum jelly and no complicated assembly required! Simply place the gliding base plate into the quality acrylic cylinder, pour your soap into the mold at a medium to thick trace and then, once fully solidified, pop out a beautiful cylindrical log of soap using the integrated soap pusher that comes with your unit. Finally slice the soap log into perfect circular bars. It really couldn't be easier! Click here to buy the Soap Making Resource acrylic cylinder soap mold now or keep reading for more product information and full usage instructions! The SMR no-line acrylic cylinder soap mold will hold a 3 pound batch of soap. During product testing, we determined that a 3 pound mold was the optimal size to ensure quick and easy removal of the soap from your unit and to keep the product's price affordable. Remember, if you are making a batch of soap larger than 3 pounds, you can always use multiple cylinder soap molds! Also, keep in mind that unlike a log mold or slab mold, you do not have to fill this mold to the full 3 pound capacity in order to achieve an appropriate bar shape, so it is even perfect for soap batches that are smaller than 3 pounds. As you can see, this unit is highly versatile! What if you are only making a 2 pound batch of soap? Simply pour this small batch into your 3 pound cylinder soap mold. Your mold, of course, will not be filled to maximum capacity, but you will still be able to successfully produce a smaller cylindrical soap log that can be sliced at your desired thickness into uniform circular bars. Unlike a log mold or slab mold, in which your fill height will directly determine your bar's final dimension, a cylinder soap mold can be filled to any capacity and still produce a finished product that has a uniform size. 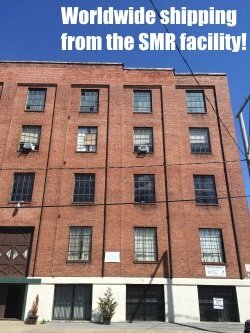 As mentioned above, SMR's acrylic cylinder soap molds can easily be used for any batch size, including bulk batches! 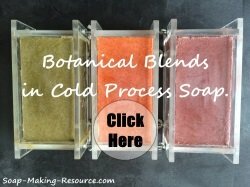 What if you are making a 5 pound batch of soap? Simply use two SMR acrylic cylinder soap molds, filling the first mold to the maximum 3 pound capacity and filling the second mold with the remaining 2 pounds of soap. What if you are making a 9 pound batch of soap? Easy! Just use three SMR acrylic cylinder soap molds, filling each one to the full 3 pound capacity. The flexible expansion capabilities of the SMR acrylic cylinder soap mold are endless and its sleek "small footprint" design takes up very little table space making bulk soap manufacturing highly convenient. Conceivably, you can use as many SMR acrylic cylinder soap molds as you need to accommodate your specific batch size! 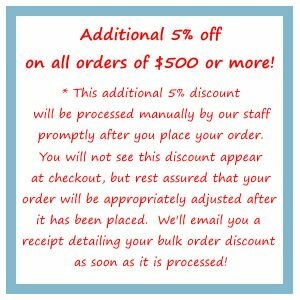 Don't worry... As you can see in the pricing below, discounts are available for multiple acrylic cylinder soap mold purchases, so the more you buy, the more you save! Heard enough? Click here to purchase the SMR acrylic cylinder soap mold now, or keep reading below for even more information including pictures of this mold in action! During the creation of the SMR acrylic no-line cylinder soap mold, ease of use was a top design priority. Below are the simple step by step instructions on how to use this product successfully. Step 1) Insert the gliding base plate into the cylinder mold and push it all the way down until it is resting on the internal lip located at the bottom of the acrylic tube. As you can see in the picture below, we are using the integrated soap pusher to slide the gliding base plate towards the bottom of the mold. Make sure that the smooth side of the gliding base plate is facing in an upward position and that the side with the circular groove, located on the bottom surface of the gliding base plate, is facing downward. Also, be sure to push the gliding base plate all the way down into the mold as far as it will go so that it is pressed against the ledge located at the bottom of the acrylic tube. Step 2) Next, set your tube soap mold on a level surface, and pour the batch into your mold. As you can see in the picture above, the opening of your mold is wide enough for most soap makers to easily pour the soap directly into the mold without spillage. You can, however, use a funnel for this step if you find it easier! Make sure that you pour the soap at a thick trace to minimize leakage! Keep in mind that this mold is meant to hold a medium to thick trace cold process soap, not a thin trace soap or melt and pour soap! Step 3) Finally, insert the integrated soap pusher into the grooves located on the bottom of the gliding base plate and apply steady downward pressure to push the soap up and out of the mold. It is important here that you use balanced pressure, not short jerky movements when removing your soap log. Most batches will release from the mold quickly and easily. Some particularly sticky soaps, however, especially those that have a high castor oil content, may require extra steps for removing the finished product from your mold. If you are initially having difficulty removing the soap from your mold, simply let your batch cure for an extra day or two. This additional "in the mold cure time" will allow excess water to evaporate from the soap causing your batch to shrink and move away from the mold's inner wall. As your soap shrinks, it will more easily slide out of the unit! Another method to help release a sticky soap from your mold is to freeze the finished batch and then allow the soap to defrost before sliding the cylinder soap log out of the acrylic tube. To complete this method, simply freeze your fully solidified soap overnight. Then allow it to defrost for several hours. Once defrosted, a thin layer of liquid will form between the soap and your mold which will release any suction and allow the finished product to effortlessly slip right out of the acrylic cylinder. Easy! Step 4) Now that your product has been removed from the mold, carefully slide the gliding base plate off the bottom of your cylinder soap log. Do not pull the gliding base plate off of your soap as this could potentially take some of the soap with it, marring the end of your cylinder soap log. To prevent damage, it is important that you gently slide off the gliding base plate. With careful, steady pressure, the base plate will easily slip off the soap without damaging your creation. Alternately, you can cut the gliding base plate off of your soap log using a straight blade soap cutter. Step 5) You are now left with a beautiful cylinder log of soap. Isn't it lovely! Finally, cut your cylinder soap log into even circular bars. As you can see in the picture below, I am using the Soap Making Resource guided soap cutter to complete this step. Alternately, you can use the Soap Making Resource wire soap loaf cutter for even quicker soap cutting! 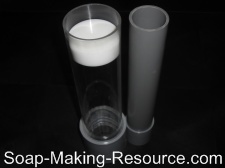 You can purchase the Soap Making Resource no-line acrylic cylinder soap mold below. We know you'll love it! The Soap Making Resource 3 pound no-line acrylic cylinder soap mold has a 3 inch interior diameter and a 12 inch interior height once the gliding base plate is installed. At full capacity, this mold will hold 3 pounds of soap. Each unit will come with an acrylic cylinder tube soap mold with attached stand, a grooved gliding base plate and an integrated soap pusher. Thank you for checking out the Soap Making Resource no-line acrylic cylinder soap mold. I think you will love using this unit for making perfect circular soaps! 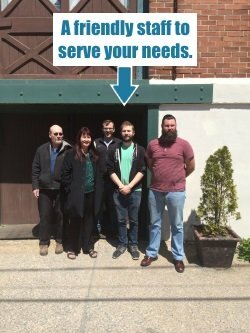 If you have any questions, please feel free to call us at 717-397-4104. We are always happy to help! Return from cylinder soap mold to the soap making resource home page.